To reach the Law Center from I-45 northbound, take the Elgin-Cullen/Lockwood exit, turn left at the light, and proceed under the freeway to the traffic light at Entrance 18 where you will take a left. Take a left at the first inner-campus road and follow it as it turns right and then left and deposits you at a 3-way stop with Calhoun Lofts on your right. Turn left, and the Law Center buildings will be on in front of you, with metered parking available to your right in Parking Lot 19B. 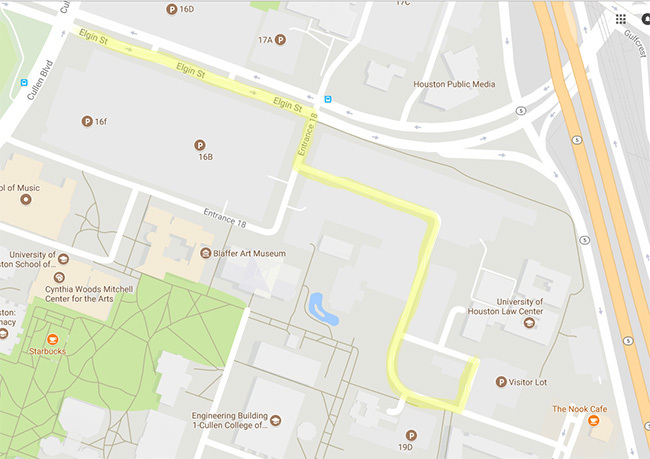 The map below shows the path once you are near campus. To reach the Law Center from I-45 southbound, take the Spur 5 exit and follow it to the first stop light (University Drive). 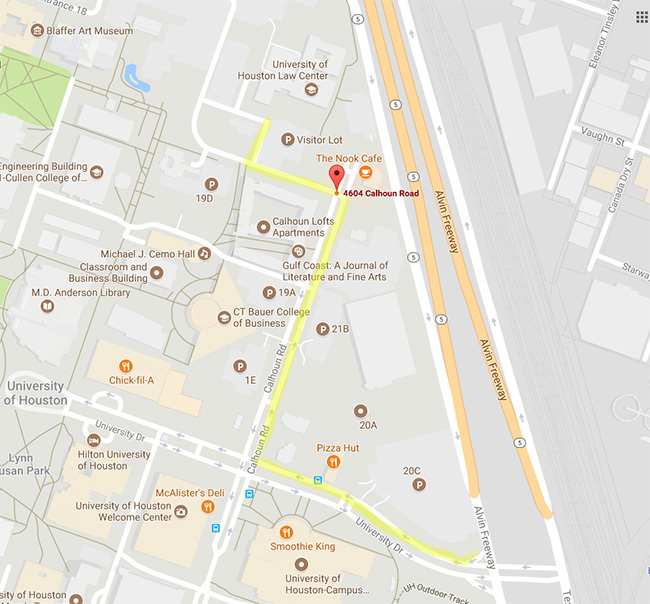 Turn right, and proceed past the Campus Wellness Center to the stop light (Calhoun). Turn right, and proceed past Calhoun Lofts to the last entrance on your left before Calhoun “dead ends.” Parking Lot 19B is on your right, with the Law Center complex flanking the bronze statue of Albertus Magnus. Metered parking is available. The map below shows the path once you are near campus. For internet mapping, the best address to enter is University of Houston Law Center, 4604 Calhoun Road, Houston, TX 77204-6060.